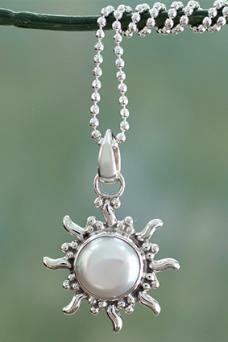 If you love summer, nature, and mystical artisan-style jewelry, nothing beats a necklace featuring the sun. As the source of all life and light on the planet, the sun is a powerful image of promise and positivity. 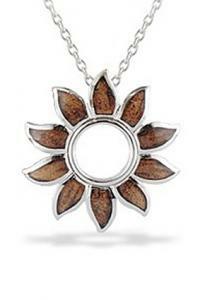 Several retailers offer a good selection of sun necklaces for you to choose from. NOVICA, which works in association with National Geographic, connects artisans around the world to customers who are interested in buying their unique goods. This company offers several gorgeous sun necklaces and pendants featuring sterling silver, precious gems, and stunning details. Quiet Sun - Featuring a sterling silver sun with a cultured pearl center, this simple and classic necklace would go with anything in your wardrobe. The pendant portion measures a little less than an inch, and it comes on a 15.75-inch sterling silver chain. It is artisan-crafted in India and retails for about $45. Verdant Sun - If you're looking for something a little more colorful, the striking green color of the malachite cabochon in this sterling silver sun necklace is sure to please. Crafted by an artist in India, the pendant measures about an inch in diameter and comes on a 15.75-inch sterling silver chain. It retails for about $50. NOVICA offers a 100% satisfaction guarantee, and you can return any item you don't love within 60 days of purchase. You'll have to pay for shipping the return unless the company made an error with your order. Shipping costs vary depending on your location, but they tend to be affordable. Because the company works with artists around the world, it typically takes two or three weeks to receive your order. NOVICA does not have a retail store; all orders are placed through the website. Bizrate gives NOVICA an overall shopping score of 9.4 out of 10, and the site won Bizrate's Circle of Excellence award in 2014. Customers praise the design of the website, the unique items, and the excellent customer service. The beautiful Sun Collection from Na Hoku offers a number of fine jewelry options featuring this motif. Na Hoku specializes in unique Hawaii-inspired jewelry. Sterling Silver Sun Pendant with Koa Wood - This simple and stunning pendant is crafted from sterling silver and native Hawaiian koa wood. The understated design would look lovely with any outfit. The 7/8-inch pendant hangs from an 18-inch sterling chain and retails for about $250. Yellow Gold Sun Pendant with Shimmer Diamond - The focal point of this lovely design is an almost one-inch sun pendant crafted in 14k yellow gold and set with yellow mother of pearl. A ring of tiny diamonds draws the eye to the center of the pendant where a larger diamond swings in the middle of the sun. The diamonds total 0.42 carats, and the pendant comes on a 17-inch, 14k, yellow gold chain. It retails for about $1,600. Na Hoku has a 21-day return policy for all non-custom jewelry. You will receive a full refund if the jewelry is returned in original condition within that time period. Shipping is free for orders over $200. Most items are shipped within three business days. You can visit the Na Hoku in Hawaii or one of their other locations in the contiguous United States. You can also order any item through the website. Reviewers on Yelp.com give the Honolulu Na Hoku store 3.5 out of 5 stars, praising the amazing designs and selection and the good customer service. Some people had problems with custom orders and complained about the processing time for these designs. Specializing in carved coconut shell and gemstone jewelry, Sol Art Studios has several lovely designs featuring the sun. These are casual jewelry pieces that will look great on both men and women. Sun Necklace - This design is carved from coconut shell and set with turquoise. It's 1.1 inches in diameter and comes suspended on a sturdy adjustable cord. You can choose from white, brown, or black shell. This necklace retails for about $60. Turtle in the Sun Necklace - This necklace features the Hawaiian sea turtle, which is said to symbolize long life and peace. The 1.3-inch diameter design is made from carved coconut and has a turtle surrounded by the rays of the sun, and it is suspended from a brown adjustable cord. The necklace comes in white, brown, and black and retails for about $40. Sol Art Studios offers a 30-day refund if you are not satisfied with your jewelry purchase. If your piece is custom it cannot be returned. Shipping is very reasonable, usually only a few dollars. The store does not post any information about shipping times or rush shipping. Sol Art Studios sells their work through hotels and boutiques in Hawaii, California, and Idaho. You can buy their full line of products through the website or through their Etsy shop. Reviewers at the Etsy shop give this retailer five stars and praise the quick delivery and high quality craftsmanship. Featuring many meaningful and symbolic jewelry designs, Satya Jewelry donates some of its profits to children in need around the world. The designs are elegant and can be dressed up or down, depending on your needs. Sun and Moon Necklace - This gold-plated brass necklace features a central pendant with a sun design and a white topaz center as well as a moon and stars. It comes on a 30-inch chain and retails for about $150. 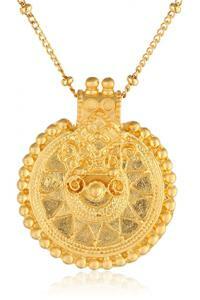 Multiple Mandala Necklace - While not technically a sun, the mandala on this necklace has a distinctly solar shape. The beautiful 18-inch necklace is made of gold-plated brass and retails for about $160. You can return any unworn jewelry item for a full refund within 30 days. You'll need to pay shipping, but you can receive a refund or exchange. 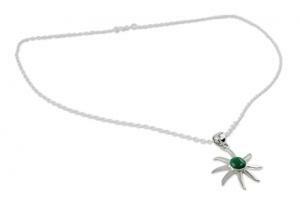 Satya Jewelry offers free shipping for orders totalling more than $150. Shipping time is usually five to seven days. You can buy Satya Jewelry through their website or at one of their three New York City boutiques. This popular jeweler was listed as the best source for everyday jewelry by New York Magazine in 2005. The review praised the subtle, fun style of their pieces. Whether you're looking for handcrafted Bohemian pieces or stunning fine jewelry, there is a sun necklace design that's perfect for you. This classic motif is ideal as a summer accessory or vacation necklace, but it also works for everyday wear. Choose a design that fits your unique personality.